What kind of perspective do you have after your experience at a Division II school like St. Thomas, a military school like Air Force, a northern school like Notre Dame, and a tradition-laden SEC school like LSU? I feel like I’m one of the most blessed people in the coaching profession, not only because I have had such diverse opportunities and experiences as a head coach at four wonderful institutions, but also because I got to grow up in Miami, Fl. as the son of a legendary college coach as well. My dad, when he retired from coaching after a 30-year career, was generally regarded as the greatest junior college coach in history. He was the first to win 1,000 games in his career, he won a national championship, had three second-place finishes and one third-place finish. I believe he had something like 35 of his former players go on to play in the Major Leagues. Growing up in that environment and hearing my father speak about college baseball every night at the dinner table, my heroes were other college baseball coaches. Most kids want to grow up to be major league ballplayers; but I wanted to grow up to be a college baseball coach like my dad. The opportunities that I’ve had in my life – first at a small, private Division II school (St. Thomas University) where you had to do everything yourself because you had no support; then to coach at a place [Air Force Academy] where the mission of the institution was so much greater than fielding a good baseball team; followed by being at a wonderfully strong academic and spiritual university in the north [Notre Dame]; and finally to then to have a chance to be at a place in the SEC (LSU) that has the resources to allow you to compete at the highest level – have been amazing. I don’t think I could have scripted it out any better as far as opportunities for a college baseball coach. I just feel like I am the luckiest guy in the world because I love all four of those institutions. 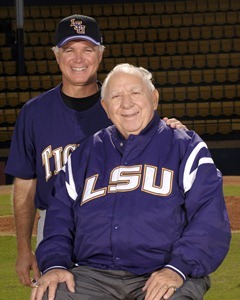 I was raised by Demie Mainieri, who was not only a tremendous father but a tremendous mentor for me in the profession. The thing for me that has never changed is that when I told him I wanted to be a college baseball coach, he instilled in me the right reason to go into coaching. Quite simply, that is to impact young people’s lives and to teach them lessons that will allow them to be successful in baseball that will stay with them for their rest of their lives. Those lessons then will help them be successful in any endeavors in which they so choose to be involved later in life after baseball is done for them. That’s always been my guiding light – from coaching at a small school like St. Thomas all the way to LSU. I know the pressure to win increased with each stop along the way, but my vision of what a coach is and what his role should be in other people’s lives, has never changed. And for that I am very proud. I’ve never compromised my principles, I’ve always believed in integrity and ethics, doing things within the rules, building confidence in young people the right way. I’ve been so fortunate to have had great assistant coaches and support staff all along. Obviously, I’ve been surrounded by some wonderful young men that have played on our teams and I hope that they would verify this is how we approached things all the time. From your great mentors to your accomplished protégés, what’s the common denominator through it all? My dad always preached to all his children about telling the truth, serving others, doing the right thing all the time, and that your conscience is your guide. Lying, cheating, and stealing were never concepts that were allowed in the home of Demie and Rosetta Mainieri – I can assure you of that! It becomes part of you and you do it that way. I tell our players all the time, if we’re fortunate enough to hold the big trophy above our heads at the end of the year, we want to feel great about it. And the only way you’re going to feel great about it is if you do it the right way. We’re not going to look for shortcuts, we’re going to purposely look for the hard way to do things, because when we do accomplish things, you’ll know that you’ve earned it and you’ve done it the right way. My dad instilled that in me right from the get-go. Then I had an opportunity to play for Ron Maestri at the University of New Orleans, and he was like a second father to me. His work ethic and his charisma and all those types of things rubbed off on me as well. You saw how important it was to promote the program in the community, to get people to like you and like your kids. If you did that, then they would be willing to support the program. Once I started my coaching career, I was very fortunate to be close to Tommy Lasorda. Every time I was with Tommy I learned more and more about how to handle players, how to build their confidence, how to create an environment that players enjoy playing in and how important that was to your success. I have also had former assistants go on to have great success as head coaches, like Brian O’Connor at Virginia. He has many of those same qualities – charisma, knowledge, a tremendous will to win, work ethic, and uncompromised integrity. I hope that he and others learned some of that from our time together. What does it mean to be a 2014 ABCA Hall of Famer?